On our website, you will find hygrometers that can measure relative air humidity, or combined devices that can also measure temperature. These hygrometers measure different ranges of humidity depending on the model. Relative air humidity is an important factor in most sectors, including industry, transport and gardening. They are of versatile use. Some of our models provide a data logger function for up to 60.000 measurement values which makes long-term measurements possible. After the measurements, the determined data can either be stored on an internal storage as for example a memory card, or be transfered to a computer via interfaces as USB. Further archiving and analysis can take place then. Many of them also include software with which it is possible to have your collected data displayed on your PC with the help of a table or also as a graph which can help and assist you to analyze the outcome of your test series. By simply saving the data on your PC it is also made possible to make long-term measurements over a long period of time. In addition to tat it is also possible to compare the results of the test series in certain time intervals like months, quarters and even years. By storing them you are able to compare them with the previous year and also years. Since these products are also made to measure the climate inside a room you can see the humidity which is inside a room. More information on that will be given below. There is also the calibration standards for the device which makes it easy to ensure that measurements are extremely accurate. Many of our hygrometers come with an ISO calibration certificate and some models are legally validated. They are very useful in evaluating damage in a warehouse. 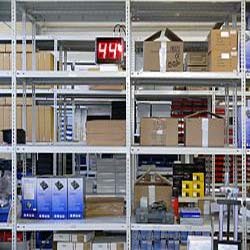 If you can't find the hygrometers you are looking for, please contact us and we will help you find the best solution to suit your needs by calling our offices on: UK customers +44(0) 23 809 870 30 / US customers (561) 320-9162 and our technical staff will advise you regarding our products. All hygrometers come calibrated, but as their sensor's accuracy deteriorates with use, they should be recalibrated on a regular basis. A calibration can be done by the user of the device by using that optional calibration standards or the device can be sent to us and we will perform a recalibration that will meet ISO standards. (Calibration / recalibration of hygrometers). Information about relative humidity: Relative humidity (r.h.) shows the relationship between absolute humidity (the amount really there) and the saturation state of water vapours. Relative air humidity is measured using hygrometers, that show on their displays from 0% (absolutely dry air) up to 100% (air that is completely saturated, such as fog, clouds or steam bath). 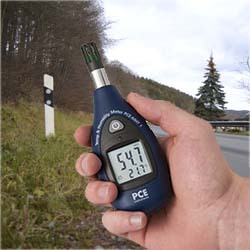 Some models of hygrometers have an unlimited measurement range. The physical area is between 40 and 65% r.h. Given that hot air possesses the ability to absorb more water vapour than cold air, people feel that in winter, air is too dry and in summer it is too humid. If air heats up it increases the amount of water vapour to that of saturation. The consequence is that the % of relative humidity decreases while the real quantity of water remains constant. Something similar occurs when air is cooled, decreasing the quantity of water vapour. This increases the percentage value of relative humidity. Condensation forms when there is an excess of water in saturated conditions. Some of our hygrometers offer the ability to not only measure relative humidity and temperature, but can also calculate dew point and dew point temperature. Dew point temperature is defined as the temperature at which the actual vapour content of air is the maximum (100% relative humidity). Dew point temperature is independant of the actual temperature. One possibility of dew point temperature is freezing metal until its surface forms condensation. The temperature of the metal will then be the dew point temperature. The dew point can be a reliable parameter when it comes to the determination of reasons for mould growth. 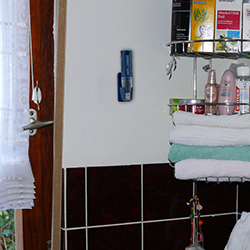 Mould growth is an important reason for medical issues. Therefore it is very important to As we have mentioned, many of our hygrometers show dew point on their display. Information about mould growth and humidity: Mould growth is already possible when the air humidity exceeds 70%. Since mould has an effect on the human health, it needs to be prevented or eliminated quickly. Especially babies can be affected by mould, because their immune system is not yet strong enough to defend external influences. Moreover, it is very important to determine humidity and temperature in warehouses, because some goods require certain environmental conditions as for example food or flowers. Foul food would mean additional payment for a reseller of groceries and dried flower mean that the seller of those ones will be unable to sell them. With the high accuracy of our products businessmen will easily be able to determine the surroundings of such goods and control parameters like temperature and humidity in a better way. Using our Thermo-Hygrometer devices you can measure relative humidity, determine the source of damn and moisture problems and indicate whether moisture reduction and control strategies are effective. Like it has already been mentioned above these instruments are sometimes also able to indicate the humidity inside a room and together with this they party indicate when a room needs to be aired so that mould can't occur. This is very especially important for families with small children since mould can be very harmful for small kids. It is possible that they suffer from lung diseases when inhaling those mould spores. These helpful gadgets help you to keep your home as dry as possible and as dampish as needed. Immediately when the humidity gets too high some indicate this with an optical signal and some with an acoustical signal to the user. He or she then can react immediately and open a window to et the room aired. By doing so serious damage can easily be prevented and a lot of money can be saved because the problem is that in the simple case that there is mould on the roof or on the wall it often as to be fixed again by a professional who charges lots of money on the one hand and on the other hand there is a lot of stress coming up when having a craftsman at home. Some humidity detectors in action are shown below. If you wish to view or print a selection of hygrometers from our catalogue, click the PDF symbol.